Apple should guarantee him a job when he graduates. Good idea, unless he decides to be a pig farmer for a living. 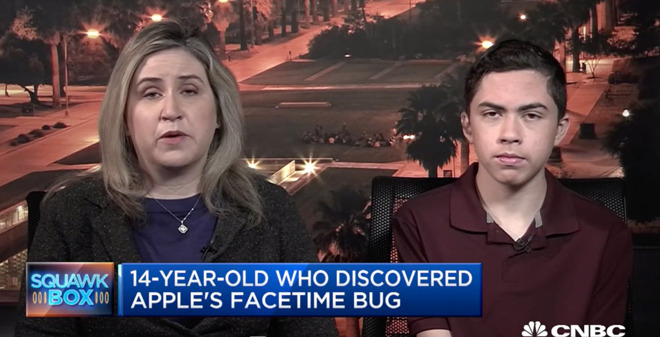 Why, just because he was lucky to find the bug? He's already getting a bounty, if he really wants to work for Apple he can study and demonstrate he's Apple talent material. Do the current iOS and macOS betas have the fix? Spoken like someone who has no life experience and even less compassion and humility for the human condition. Sadly, this is the kind of ilk parents are squirting out these days. Why the hell should they guarantee him a job? Cause he accidentally found a bug? I mean, wow. I wouldn't worry about it. I don't think Apple raises pigs. Good move by Apple, the story went national (international maybe) and now so will this. I agree that they shouldn't guarantee him a job, but maybe let him know if he chooses to go down that tech path they would put him at the front of the line for an internship interview. Doesn't give any guarantees but let's him know there is a future there if he wants to work for it. Even if he does decide to take up pig farming for a living. Because farming ain't cheap. Oh boy! Looks like you got the pig farmers all riled up! Hey! Pig Farmers got pride ya know! It is more than just pride, a modern day farmer is well educated and at the forefront of technology. I know of two locally with engineering degrees. One even designed and built solar powered housing back in the 1970’s. Not to mention a large number of innovative machines to keep business efficient. Beyond that have you you guys ever checked out the farmers daughters. They grow some mighty fine woman in the country.